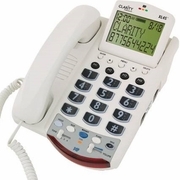 The Clarity Professional XL45™ corded telephone, featuring Digital Clarity Power™ technology, improves conversation by making words not only louder, but also clearer and easier to understand. With up to 50 decibels of amplification, the XL45™ is ideal for those with a severe hearing loss or low vision. Eliminates feedback and distortion for clearest sound Balances soft and loud sounds for a comfortable listening experience at any volume 50/15 Total Decibels for louder and clearer conversations. Increases the volume of your voice up to 15 dB with no loss in the incoming volume ClarityLogic® is the latest technology from Clarity that allows for simplified customer support that provides accurate and immediate results. Clarity representatives can remotely evaluate a phone and adjust settings for easy phone configuration Hear Clearly. Outgoing speech amplification up to 15 decibels Easy to Use. 12 speed dial buttons Superior Technology.